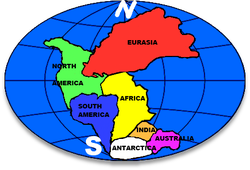 Continents together as "Pangea", according to Plate tectonics, there would have been once one supercontinent floating in one big ocean.​​ It is a model that does not take into account the fits that can be made with the western coast of the american continents. See: http://en.wikipedia.org/wiki/Plate_tectonicsBased on the assumptions that:-the spreading and ages determined on the oceanfloor are correct.-that the growth on the ocean floors must lead to subduction of the excessive material somewhere else, because earth must have had a constant mass and volume during millions of years.-continents were together once as the Pangea, on an earth with the same size as presently.-time periods as mentioned in conventional geology are correctProyection of the continents together as the Pangea gives a deformed result, without an exact fit.Based on especially geological interpretations. Image thanks to Michael Netzer, Resume of expanding earth model; the continents fitted once on an earth with a much smaller diametre. 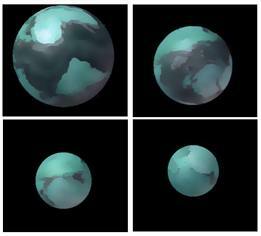 The growth of the earth happened because of seafloor spreading. 3 stepped double sided symbol of The Cosmogony of The Three Worlds, a symbol one can find all over the world. 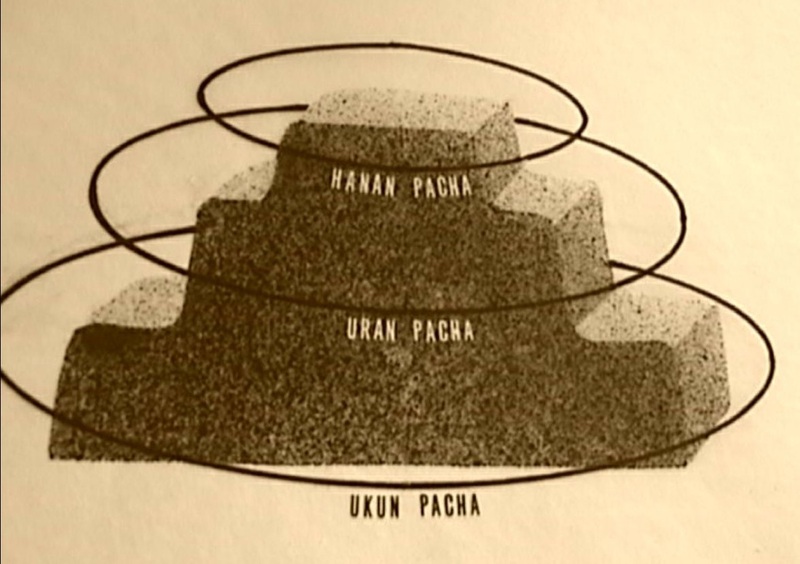 Visualization of Gamarra's ideas, where during the Hanan Pacha time earth had a smaller orbit and was closer to the sun, and later orbits mark later periods after orbit changes. See: http://www.jamesmaxlow.com/ and othersTo be clear, I am here talking about an expanding earth with constant density, meaning Earth's gravity at its surface increased over time, in line with its growing mass and volume.Based on the assumptions that:-the spreading and ages determined on the oceanfloor are correct.-that the supposed growth on the ocean floors led to growth of the whole planet-the Pangea continent must have been on a smaller earth, as the perfect fit on a globe that was 55% of present day diametre can't be a coincidence-time periods as mentioned in conventional geology are correctProyection of continents together as the Pangea gives an almost perfect fit on a smaller earth.Based on Biological and Geological interpretations. See: http://www.creationscience.com/onlinebook/HydroplateOverview2.htmlBased on the assumptions that:-the spreading and ages determined on the oceanfloor are incorrect-many of the geological features on earth can be explained with one catastrophic event, namely the flood-only South America and Africa have been closer together, but not completely and on the same size as present day earth-the Bible is correct that God created the earth before the flood and earth has had the same size since thenBased on geological and biological interpretations and the Bible. See: http://www.electricuniverse.info/IntroductionBased on the assumption that:-Electricity in the history of earth has been overlooked-Electricity is important to consider in geological events as earthquakes, mass discharges and scarforming on planets (the scar on Mars, Grand Canyon)-Electrical reactions between celestial bodies could happen and might have been important in the creation and history of earth, based on the vision that space is not empty but is like a plasma that can conduct electricity very well-the geological timescale might be wrong because of electricity influence that could make the assumption of stable decay rates for Radiometric dating wrongBased on physical (electrical) and mythological interpretations. To my opinion, the best proyection of earth into the past was done by James Maxlow with a very good and detailed investigation where he separated the seafloor and was able to get an almost perfect fit of the continents on a smaller sized planet. He was even able to make proyections further back in time, pre-Pangea on an even smaller earth. He is the one that has made the most precise and oldest proyections of earth. But I do not believe in the steady going on process of growth. Electric Universe, Hydroplate theory and Alfredo Gamarra have all arguments that show that we have to consider many options. That earth has been smaller has been proven, the exact process of growth and all that happened to earth during it's history has to be investigated much further. Hydroplate theory might very well explain that the flood had a great influence on rather recent geological features. Alfredo Gamarra makes the connections with human history and archaeology. His assumption of less gravity in the past is based on biological, mythical, biblical and archaeological reasons. There is a coincidence with Maxlow's conclusions but the timescale is much different. But that timescale could be completely wrong!